Belle Plagne is one of the ten ski resorts in the Grande Plagne ski area and one of its six mountain villages. The ski area is located on the doorstep of the Vanoise National Park. It encompasses the entire Isère Valley and is adjacent to that of Champagny en Vanoise to the south. 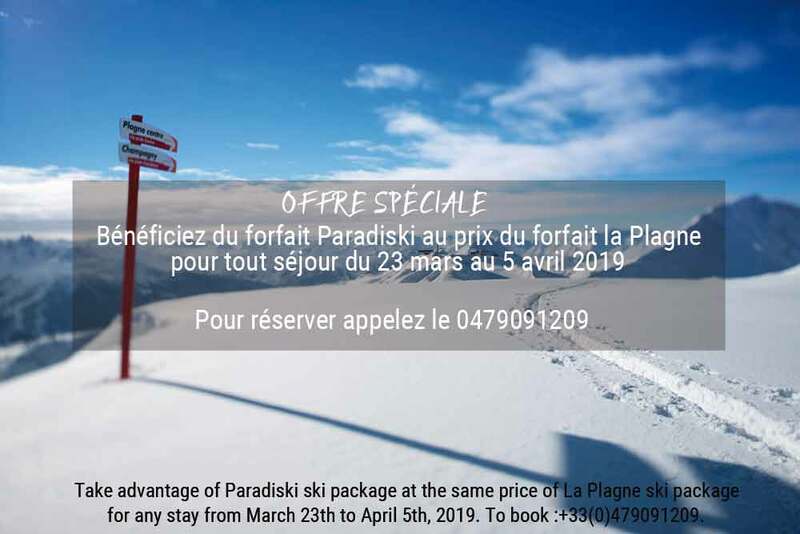 The Belle Plagne ski resort is also one of the prettiest villages in the huge Paradiski ® ski area. As you approach La Plagne, turn left towards Plagne Bellecôte, then head towards Belle Plagne. Since the resort is pedestrianised, go into the ‘upper’ underground car park, and then park as close as you can to the hotel entrance. Lyon Saint-Exupéry Airport, 180 km away. Geneva Airport (Switzerland), 150 km away. Chambéry Airport, Savoy, 120 km away. The nearest station is Aime Bourg Saint Maurice, 20 km away. Please feel free to contact us if you need any additional information on how to get to the Hotel Belle Plagne or about your ski holiday in Savoy.